CLUES TO THE TREASURES OF LIFE by Lily L. Allen. 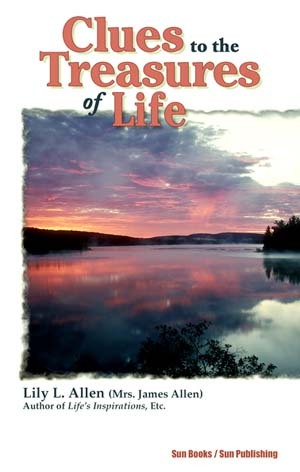 Chapters include: Clues to Life's Treasures, Clues to the Secret of Health, The Greatest of All Clues, Clues to the Abundant Life, Clues to the Glorious Destination of Man, Finding the Deathless Life, The Law of Attraction, The Will of God Concerning Man, Clues for Everyday Life, Etc. 83 pages. 5x8. Paperback. ISBN: 0-89540-451-6. (ISBN-13: 978-0-89540-451-0). $10.00.